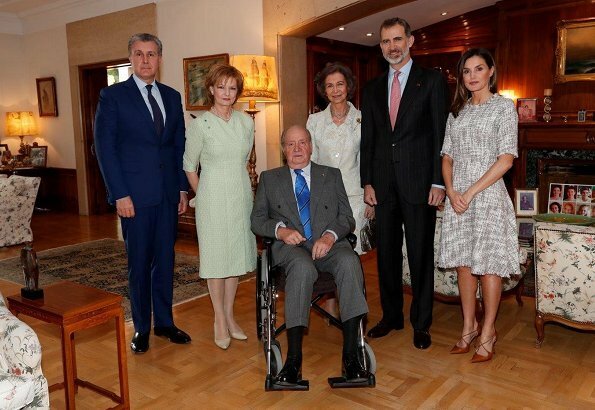 On May 28, 2018, King Felipe VI and Queen Letizia, accompanied by King Juan Carlos and Queen Sofía, held a lunch at the Zarzuela Palace in honour of Crown Princess Margareta and Prince Radu of Romania who are in Spain for the Madrid 2018 Book Fair. Romania is the Guest Country this year. 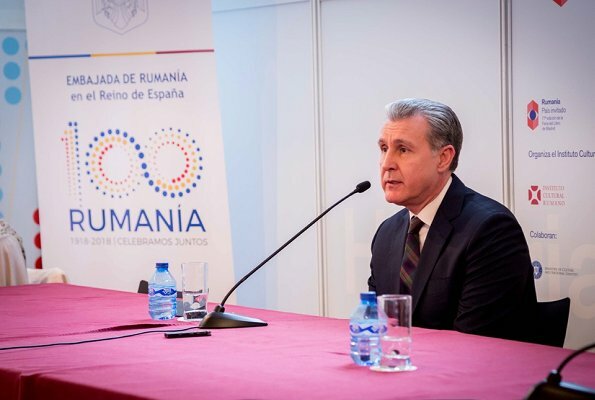 Prince Radu delivered a speech at the Madrid 2018 Book Fair at the Retiro Park. Crown Princess Margareta of Romania and her husband Prince Radu are making a four-day visit to Spain. Very wonderful royal couples of King Felipe and Queen Letizia of Spain and Princess Margareta and Prince Radu of Romania. well this is a rare, Queen Margareta and prince Radu of Romania in Spain with the SRF. In all the times I seen,the Q she barely ever smiles,neither does Pss Anne, but she do on occasion.All three Ladies are dressed very nice,hope they all enjoyed them self. Not so rare, Margareta belongs to the Borbón-Parma, so is a Juan Carlos' cousin. And the late Mihai I of Romania was Sofia's cousin also.. Very pretty and elegant. However, I would have added some lovely brooch, necklace or thin belt. Letizia looks great. So elegant and lovely. Although I wouldn't have minded lovely brooch or slim belt to her waist. All ladies looking smart. I like Letizia's dress - the cut is lovely. Romania is a republic, which means that Margarita is not queen. In her father's will her title is the Guardian of the Crown. While the fabric of Letizia's dress is not very pretty, she is still one of my favorites. I like the style of shoes, but perhaps another color and coordinating belt would have been better. The cut of the dress looks great on the Queen. Me gusta mucho el vestido de la Reina Letizia, tiene un estampado original y un corte muy favorecedor y femenino. Sus zapatos son preciosos, lo mismo que su cabello. Margareta y Sofía también se ven bien. JC en silla de ruedas, que se recupere pronto. Her title after the death of King Mihai is Her Majesty Margareta Custodian of the Crown. It was her own choice not to use the title of queen,although she could have used it. In my opinion the shoes Letizia is wearing don't really go well with the dress even though the model is wearing sandals of a similar colour.